Urban loneliness is a virtual pandemic. Even though there have never been as many cities across the world as there are right now with such high populations, urban loneliness carries with it huge social, medical and financial consequences. Why are cities the new capitals of isolation? Ideas contributor Tom Jokinen believes the design of urban centres may actually be the cause of urban isolation. Yet they may also contain the ingredients for a more integrated social landscape. It's hard to believe that anyone could be lonely in the city, surrounded by millions of people. But urban loneliness is real, and it's at the centre of a health epidemic. According to Dr. Vivek Murthy, former United States Surgeon General under President Obama, loneliness can lead to increased risks for heart disease, anxiety, depression and dementia: in stark terms it is the same as smoking fifteen cigarettes a day. Should Canada develop a strategy to combat the growing problem of loneliness? Yet the idea of solitude and isolation is central to the culture of the city. 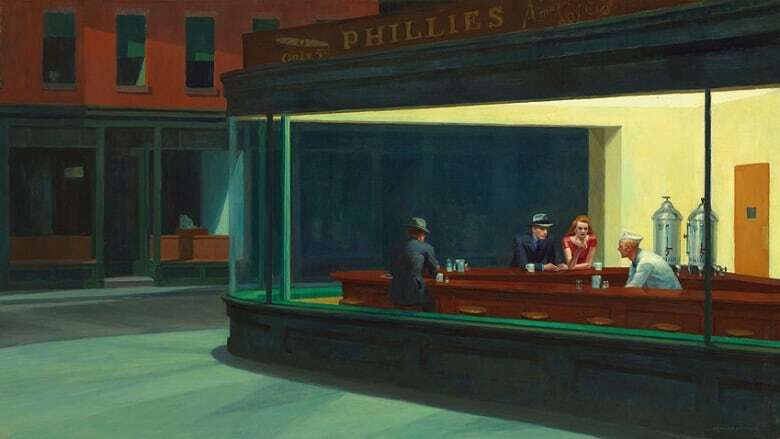 Think of the paintings of Edward Hopper depicting nighthawks at the diner. His realist paintings are actually about something more abstract: what it's like to be alone in a city of millions. Eye contact is never made in a Hopper painting -- and the people in his paintings look like the last survivors of some urban catastrophe -- one that's been a long time coming. In 1920, only 5 per cent of Americans lived alone. By 2016, that number was 27 per cent, and most of the growth of solo living has been in the cities. A study by the Engaged City Task Force in Vancouver asked people to report the biggest problem facing that city. The result was surprising: they might have said homelessness, or the opioid epidemic. But the number one problem in Vancouver according to residents was urban loneliness. What is it about cities that makes us so lonely? Just look up. The urban environment, with its tall glass towers of one-bedroom and studio condos is built for loneliness, it's designed to cut people off from each other. But things may be changing: new ideas like co-housing, where families live together, mean the city itself could become less forbidding. But is it enough to face down an epidemic? Charles Montgomeryis an urbanist and the author of Happy City (Doubleday Canada/2013) which argues that the way we build cities affects how we feel, how we think, how we behave as a society. Eric Klinenberg is a sociologist and professor at New York University. He is also the author of Going Solo: The Extraordinary Rise and Surprising Appeal of Living Alone (Penguin Random House/2012), and a new book, Palaces for the People (Penguin Random House/2018) on the importance of shared urban environment. Amie Peacock is the founder of Beyond The Conversation, a Vancouver support group for lonely people. Members include Manjit Thandi and Dee Pinnock. Tesicca Truong is an activist, helping Vancouver youth to get involved in the planning and design of their city, through an organization called City Hive. She served on the mayor's Engaged City Task Force. Mark Busse is a designer who also served on the Vancouver mayor's Engaged City Task Force, looking into urban loneliness. Melissa Higgsis a Vancouver architect, HCMA Architecture + Design, and worked with Mark Busse on "activation" of city laneways. Olive Dempsey lives in Vancouver co-housing. Kimberley Brownlee is a professor of philosophy at the University of Warwick in Coventry. Is Vancouver lonelier than most cities or just better about addressing it? The Guardian, April 4, 2017. In China, live-streaming apps soothe lonely souls and create fortunes, Los Angeles Times, January 5, 2017. **This episode was produced by Tom Jokinen and Greg Kelly.